I will have to admit that when Google Chrome came out, I was really impressed by its features and looks. It was a refreshing respite from both Firefox and IE7 that I was both using then. I was enjoyed using Google Chrome at first but noticed after awhile that it starting to run slow. Even when Google put it out of beta, Chrome’s speed was not commendable. But finally, Google probably heard users’ complaints and so they decided to release a new Google Chrome and put the browser back to beta mode. The new Google Chrome beta was tested to run faster than both the stable version of Chrome and the original beta version. 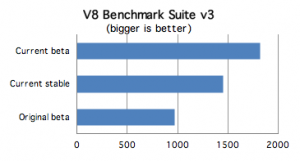 According to a Google Chrome blog post, the current beta is 25% faster than the stable version using a V8 benchmark while 35% faster using a Sunspider benchmark. Comparing the current beta version’s speed with that of the original version indicates that the former is twice faster than the latter. I downloaded the new beta version this morning and noticed no significant speed boost really. Or maybe my observation is just wrong, well at least if we have to take the result of Google’s benchmarking test of the new beta Google Chrome to be true (see image below). But frankly, if there was really a speed boost, it has got to be very minimal. Anyway, aside from the “alleged” speed boost, the new beta version of Google Chrome also has some new features including form autofill, autoscroll, full page zoom and a new way of dragging out tabs to arrange multiple tabs side by side. Additionally, if you install this new beta version, you will be automatically notified of enhancements, new features, and other important information about Google Chrome’s developement into a new stable version. So, have you downloaded and installed the new Google Chrome beta? If not, you can download the stable version here. If you are already using the new beta version of Google Chrome, did you notice any significant difference with its speed to the speed of the stable version? Feel free to leave a comment below.